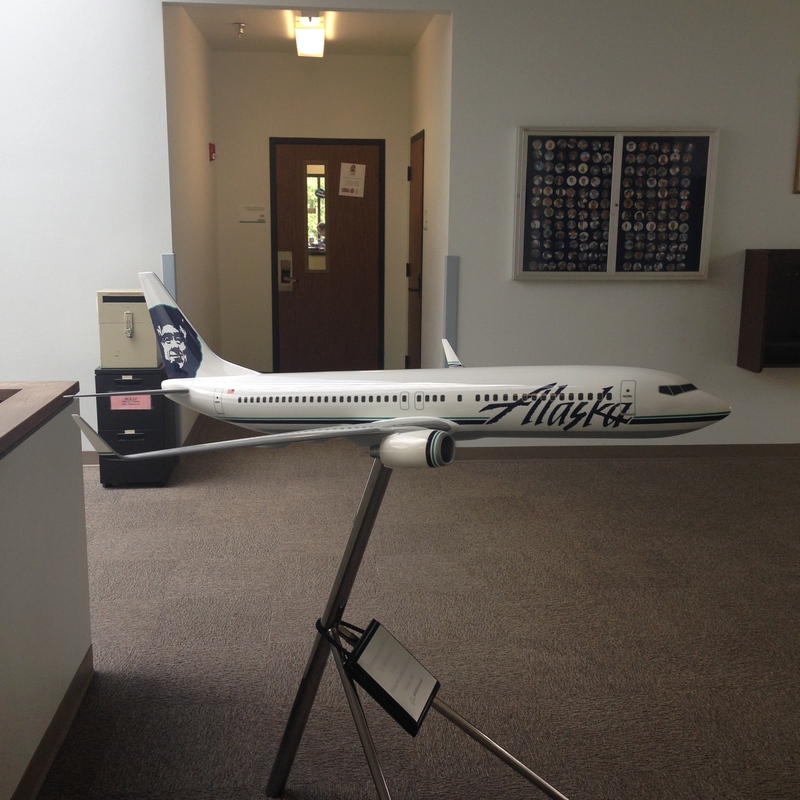 Recently had the opportunity to visit the Alaska Airlines Flight Operations Training Center. The Spirt of Alaska was very much alive and palpable here. Located near SeaTac Airport, the center is a two-story building housing training facilities for Alaska’s almost 2800 flight attendants and approximately 1400 pilots. My first impression was that of entering a small private school. As it was early, activities had not quite kicked off; there was minimal activities in the hallways. However, behind closed doors there was a flurry of activity and things happening to keep the Alaska Airlines operation running safely, comfortably, and on-time. Alaska Airlines has come a long way from its humble beginnings as McGee Airways in 1932 and has grown in to a profitable airline that has 136 aircraft, and serves almost 100 cities. Alaska Airlines is adored by the industry and has a loyal and dedicated customer base as well as motivated and dedicated employees. It was via a some of these motivated and dedicated employees that I got the opportunity to see how Alaska Airlines has become, and remains, truly Alaska (the Alaska spirit). During the visit I was shown and introduced to many people who are responsible for the safe operation of Alaska Airlines flights throughout their system. We toured the Systems Operations Control (SOC) area where I was given an overview of flight attendant and piloting scheduling, dispatch, and load control. I then received a thorough overview of the Command Center. This room becomes the center of activity during emergency situations that impact the airline. The personnel giving tours were humble, thorough, and answered the many questions I had. I also had the opportunity to look upon the flight simulators used to train pilots at Alaska Airlines. The majority of the visit included time spent with Inflight Services. It was in this department that I could relate closely with. When I was introduced to the office staff, they went out of their way to make me feel comfortable and at home. After meeting the good people who manage inflight services we proceeded to the 737 mockup where safety and service procedures are learned and perfected. As Alaska Airlines only flies the 737, they have one mockup that is used for these purposes. As with most mockups, this one is a very fair representation of the real thing: cockpit, FC + YC galleys, FC cabin, YC cabin, lavatories. The mockup is capable of simulating different “situations” that may arise on board an aircraft: smoke in cabin, smoke in lavatory. 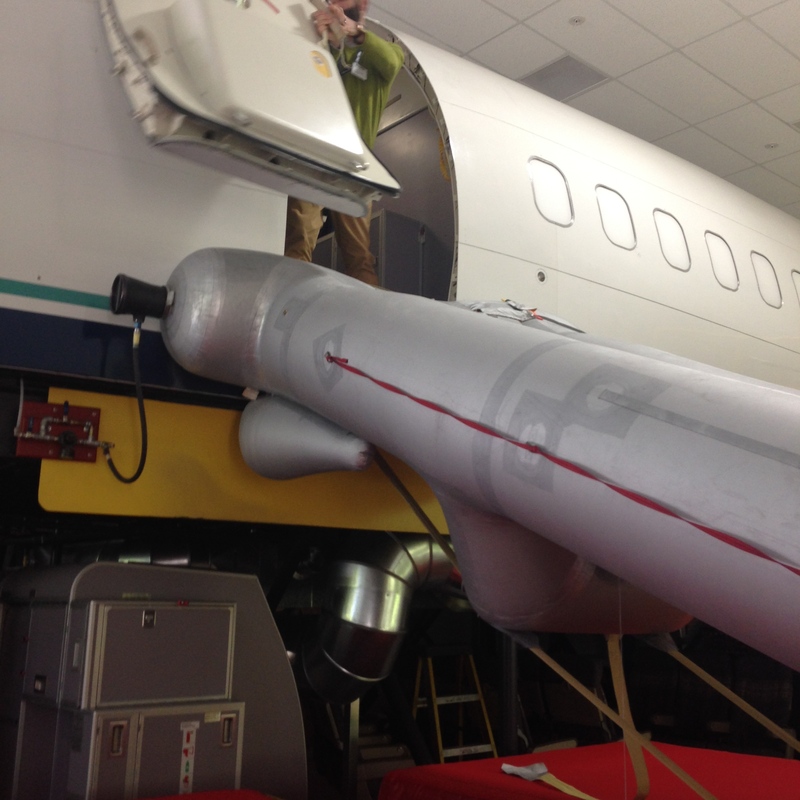 The mockup is also used for evacuation drills via emergency window exits and doors. To my delight there was a flight attendant training class in session! I had the opportunity to meet the class and observe them practicing emergency and service procedures. Ahhh, the memories! Have to say they were a nice looking group of people who were excited and happy to be joining the Alaska Airlines family. One of the takeaways from the customer service training was “don’t get lost in the task, because you have a purpose on board.” To me this sums up how to give the best customer service you can. It’s about “creating moments” with each and every passenger you interact with. Deep. There were a couple other “deep” moments spent at the training center. While watching the nicely-produced, emotional indoctrination flight attendant training video, “Their Story is Our Story”, Flight Attendant Carol S. says, “It’s not just a company. There’s something unique about Alaska. It’s spectacular.” I’d have to agree. The people that I met while on this tour are passionate about Alaska Airlines and work very hard to keep the spirit alive. They’re protective of their brand and culture. The feeling I get from Alaska Airlines is that they are a close-knit family where relationships mean everything. Because they care for each other as fellow employees, this feeling of caring and well-being is bestowed upon its passengers. Alaska Airlines has won the JD Power and Associate Award for Customer Service 7 years in a row now. They’re definitely doing many things right. A poignant moment in the tour involved visiting the Memorial Garden, a beautiful and serene area honoring those lost on Alaska Airlines 261. The garden is reflection of the caring nature of the people who are Alaska Airlines. We at AirlineGuys are always interested in sharing what we’ve learned and know about the commercial aviation industry. In fact sharing thoughtful, impactful stories and information are what we’re all about. The tour of Alaska Airlines was truly impactful. Seeing how other airlines operate, the impact that company culture has on customer service, and what makes each airline unique drives our passion to be the AirlineGuys. A very special THANK YOU to Arnie Tharp. 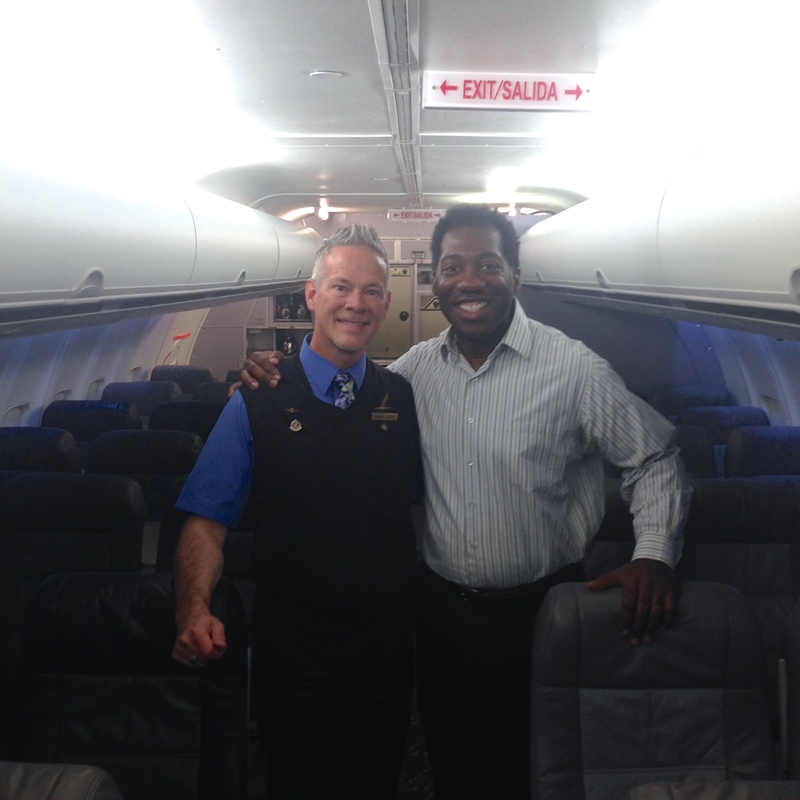 Thanks for allowing me the opportunity to observe the very special culture that is Alaska Airlines. Thanks for arranging such a thoughtful, well-executed tour. Thanks also to Blair Kimball, Todd Horn, and Ashleigh Berlin-Stebner for giving me the opportunity to observe you impart your commitment to customer service to the Alaska Airlines trainees and for your part in keeping the spirit of Alaska alive and well (you too Arnie!). The experience was definitely “North of Expected”! 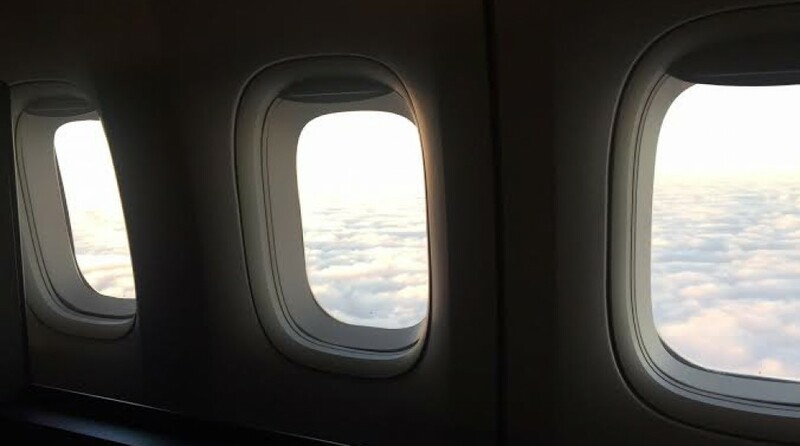 This entry was posted in Uncategorized and tagged airlines, airplanes, alaska airlines, avgeek, avgeeks, aviation, aviation friends, crewlife, customer service, flight attendants, seatac airport. Bookmark the permalink. It was our pleasure to host you! I’m so glad that you enjoyed. Thanks again for setting up the visit and taking good care of me. It was greatly appreciated. Made me proud to read this! Glad you got to visit us in SEA, Sylvester! Thanks SteveP! You all have a topnotch operation there at SEA.